The spectacle contains out of different parts. People who don't speak Quechua can sometimes have difficulties to follow the sections. The organizers try to give a correct historical reconstruction as far as this is possible. In the biggest part of the Inti Raymi are the Inca and the high priest speaking. In turn honor the representatives of the four Suyus on the big square the Inca and the Sun. They dance and play music or just listen kneeled to the Sapa Inca. A white lama is offered to assure a fertile harvest as a result of the heat and light of the Sun and the earth, the Pachamama. Until one year ago a lama was really offered but protests made this a fake act. So they tell us, but the hart the high priest holds in his hands looks real though. At 5h30 starts the Sun kissing the horizon and this is the perfect moment to set big campfires all over the fortress. Everybody starts dancing around the fires and honors the god of fire, as essential as Sun and Rain. Extensive dancing and rhythmic music bring the Suyus together to one unity: TAWANTINSUTY or the Empire of the Four Wind Directions. Visit Machu Picchu and enjoy Inty Raymi! One of the 7 Wonders of the World and enjoy the comfort of the best Machu Picchu Hotels. The Incas believed in reincarnation, even so deeply that they buried the death in the position of a fetus to facilitate rebirth. The honored ancestors, the died Incas were mummified after death and treated as they were still alive. 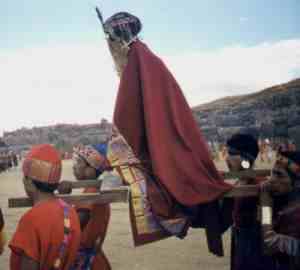 For big events as the Inti Raymi is, were they carried out of the Qorikancha to witness the festivity. 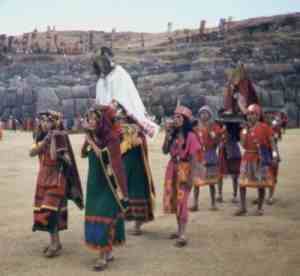 At the end of the Inti Raymi give the actors blessings to their people by forming a long colorful procession. 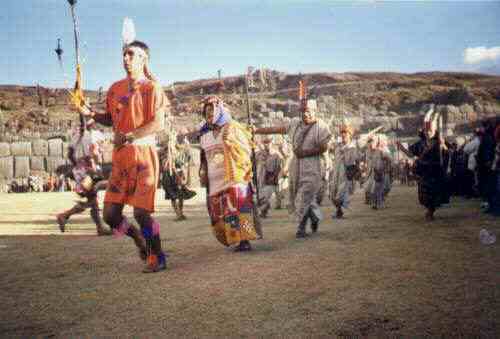 They salute also the Inti and this beautiful day, the beginning of a New Year, Inti Raymi! Next are some close-ups taken from the parade.we have the best promotional travel packages for you to enjoy an unforgettable holiday. 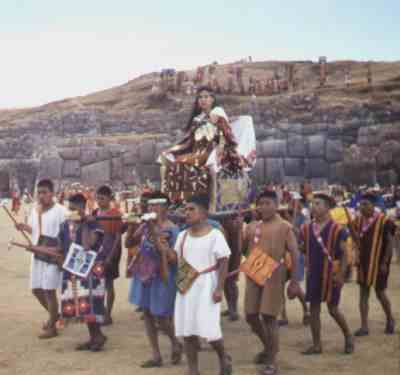 The wife of the Sapa Inca, the Mama Occla, was equally honored by her people and carried on here silver throne.